It's been a long road so far.. The Gem Of An Idea. 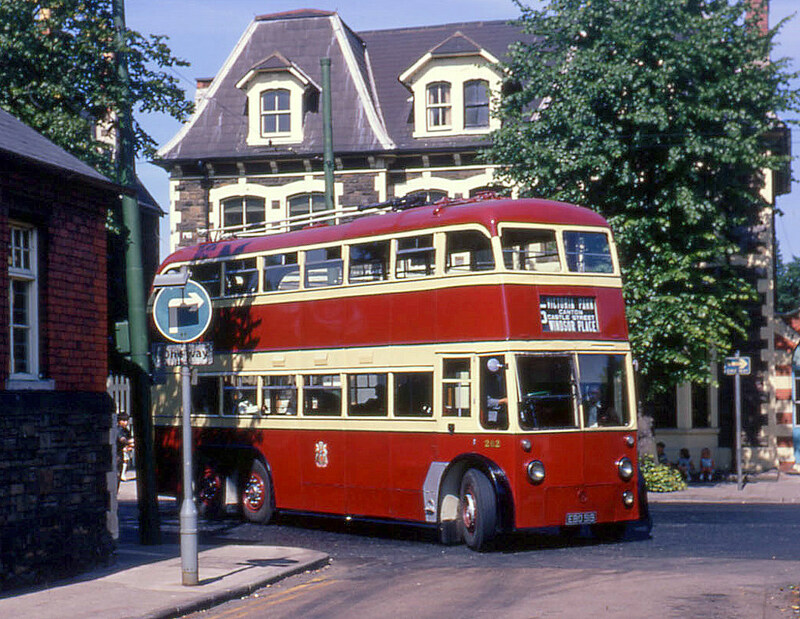 Having been born in Cardiff you might say my interest in Buses started at an early age as my late Father was employed by the Western Welsh Omnibus Company as an engineer at their Central workshops in the Ely area, whilst our first house was just yards away from termini of the corporations’ route 12 in Tremorfa. The adventure probably really started when we moved house in 1955 and with the close proximity to Trolleybus routes on Newport Road at the Royal Oak and a quarter of a mile to the East the (by then) main trolleybus depot and engineering facility of Cardiff Corporation Transport, I was hooked. Regular trips to town would always be by the preferred trolleybus and the fascination of this mode of transport, and so the all too soon run down of services commenced in 1962 which in 1970 saw the last of these Crimson Lake/Maroon leviathans pass into history, it being all the more disappointing as I had spent many hours in and around the depot getting to know the staff and how the vehicles operated. I was never one for getting involved in the collection of artefacts, last tours etc., as within a year my engineering career at sea had commenced and so it wasn’t until returning to shore employment, settling down and the Cardiff Bay Development commencing I began to think about Trolleybuses again, and the possibility that as Electric street traction in the form of Tramcars then Trolleybuses had held sway in the Docks area for 68 years, could there not be a way of introducing a heritage tourist route around the Pier Head across the proposed Bay frontage, especially as there was a National Industrial and Maritime Museum (which contained a Trolleybus) plus there was still period buildings in place. Its all very well having these ideas but the practicalities may not be foremost in ones thinking. On the one hand my elder brother was working for a number of companies vieing for construction contracts and there was a possibility of vehicle accommodation, (so vital in the early stages), but your enthusiasm for your particular interest does not come high on the list of multi national groups whose incentive is business and profit, in saying that we were invited by the Head of Engineering of the Cardiff Bay Development Corporation, more out of curiosity to a meeting but the impression was, if we had a million pounds to invest we might not only get the time but a cup of coffee, and with that our thoughts needed rationalisation and a workable strategy. Back in the mid 1960’s during one of my many depot walkabouts the large storage yard at the rear of Newport Road I noted that a number of the later numbered vehicles were being withdrawn and realised that the corporation were getting serious so took some mediocre photographs of vehicles in a state of cannibalisation, one such vehicle number 268 at the time was to play a significant part in future strategy. Some time prior to thoughts of trolleybus restoration, there had been a letter in the local evening newspaper from an enthusiast who was collecting photographs of every Cardiff trolleybus and it listed the few vehicles that were eluding him amongst these was number 268. Though the fleet number was not visible I had written it on the rear and had made contact (though its authenticity was viewed with some scepticism) I had as I thought made contact with an enthusiast which having retained his address may come in handy. During 1991 with plans now more in keeping with our assets which were nil! 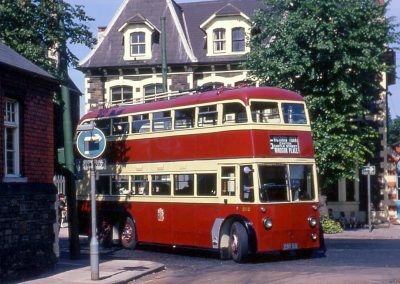 I made contact but found that the interest only stretched as far as collecting photographs but he was able to provide a name and address of someone who had been foremost in Cardiff Trolleybus enthusiast circles, and so a start to the strategy. On arrival at the address in the Cathays district of the city I was told that the house had been sold and he had moved just days before but luckily I had a forwarding address in the Heath area and undeterred went there. Our first meeting was whilst he was on a ladder decorating his hallway my initial enquiry and basic plan was of interest but he would obviously need some convincing so we started to talk. My contact had been involved with the first attempt at restoring a Cardiff trolleybus and the small group had operated under the title of the ‘Cardiff Trolleybus Society’, and came into being when on formation they had approached the transport authority to buy a fresh out of service vehicle in late 1968, and having the interest of the engineer on their side negotiated its purchase for £112 (the odd £12 represents £2/ tyre), after initial cosmetic restoration Cardiff 262 benefitted from storage at the depot and as the end of the system came ever closer interest from around the U.K. meant that enthusiast tours were arranged using not only 262 but visits from other systems operators, saw vehicles from Bournemouth, Reading, Glasgow and Maidstone. 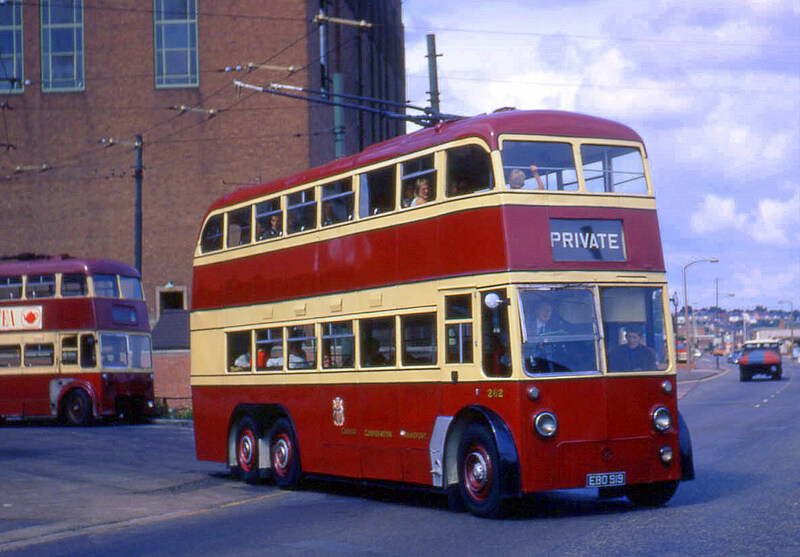 With the final week of operation struggling into January 1970, three trolleybuses participated, numbers 215, 277 and the societies 262, and as 262 brought up the rear and being the last into the depot power was switched off to end an era. So what do you do with a ten ton trolleybus, limited storage options with eviction looming, no overhead wires and the trolleybus restoration movement yet to materialise a far from bright future, with the inevitable internal group opinions to resolve. From details we have 262 was offered as a possible participant in a scheme towards the London area, there again the Bournemouth group were actively pursuing a circuit near Ringwood, neither of these were to develop. 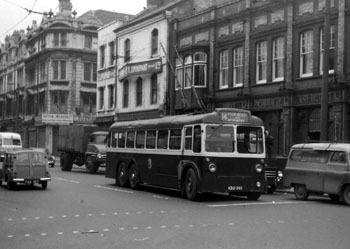 The group offered 262 into the care of the Welsh Industrial and Maritime Museum but Cardiff Corporation offered a speedily overhauled 215 and this was to prove more advantageous to the museum, so 262 was declined and as options became limited 262 passed to a local motorbus group, but the difficulties continued and eventually 262 passed as so many of the Cardiff fleet into the Bill Way scrapyard on East Dock. What is surprising and some say Bill had a soft spot for trolleybuses as they spent many years on the dockside yard as witnessed by vehicles still being there as late as 1983, in fact 262 survived for around a year until an interested party from Crawley in West Sussex called and purchased it, despite there being other vehicles in better condition though we owe him a debt of gratitude as unbeknown to him (so it seems) he was about to save the last surviving Cardiff constructed trolleybus by Bruce in the world! From Cardiff, 262 found its way to an old quarry? near the owners home in Crawley where it would remain for a number of years until relocation with the possibility of restoration at the Sandtoft Transport Centre near Doncaster was arranged. It is worth recording here what befell the other Cardiff survivors. Cardiff 203 had been donated by the council to the Reading Trolleybus Society in the early 1960’s and had been moved over to Carlton Colville near Lowestoft, this eventually has had moves to Kidlington near Oxford and now resides in restored condition at Sandtoft. Cardiff single decker 243 on disposal in 1964, being a special one off and being the last three axle single decker built and in revenue earning service in the U.K. was donated to the National Trolleybus Association, commencing a nomadic existence that saw it moved first to Bridgewater in Somerset then returned briefly to Cardiff before entering the quarry in Sussex though there is a photograph of it in Wolverhampton at one stage? Unfortunately there were other classes that never made it into restoration namely the ex Pontypridd English Electrics, or their successors in the numbers 238 -242 but even more disappointingly none of the final 1955 delivery such as 277 survived although 243 represents a single deck version. Things could have been a lot brighter for 277 if it hadn’t been purchased by the LTPS for spares and unconfirmed reports suggest that the upper deck was dismantled for cost savings and within the last decade through open storage it collapsed into obscurity. The fourth and final survivor 215 as previously mentioned resides within the national Museum of Wales collection now based North of the city at Nantgarw, it is safe and in undercover storage whilst it is similar to 262 it has subtle bodywork differences and was built by East Lancashire coachbuilders. From discussions things must have proved interesting as my new friend had stopped painting and an embryonic plan was evolving and how the few people who survived could possibly be interested were to be contacted and the latter part of 1991 into the New Year began to show that there was a groundswell of opinion for the formation of a public meeting which was scheduled for February 1st 1992 and so we were at the start of our journey. The initial meeting took place at the headquarters of the Butetown Historic Railway Society in Bute Street and was attended by a sizeable crowd who listened to my presentation and proposals in fact the intervening months hard work had spread the word amongst the South Wales area trolleybus enthusiasts some of whom were present. During the evening at a refreshment break a group of those present left and failed to return, but enough remained to sign up as members, form a basic committee and make plans for a way ahead and so armed with things to do the monthly meeting nights were set for the third Sunday of each month. Slowly the group evolved as did the membership so thoughts centred on discovering the whereabouts of surviving vehicles ownership etc. With hopes high it didn’t take long for the complications of obtaining suitable undercover storage to arise, even with Cardiff’s redevelopment moving apace all buildings were being demolished or redeveloped so we became a monthly meeting place reminiscing about what had been and trying to progress the fledgling group. Our enquiries about vehicle ownership led us surprisingly to the single decker 243 and the owner though living in the Swindon/Reading area working for British Rail and based on our doorstep in Cardiff. The initial chat with him was cordial but it was evident that he had seen this many times before and the outcome was a watching brief but no commitment (as yet). Likewise the owner of 262 was involved with maintaining it on site at Sandtoft and commendably progressing its restoration as and when finances permitted, so at the time it was in the best place. After around three years of gradual development it appeared that the group was treading water having relocated our meeting place due to the inevitable redevelopment plus the railway society were uprooting and moving their collection over to nearby Barry in the Vale of Glamorgan due to plans in Cardiff docklands falling by the wayside but plans by the council in Barry were promising and they would have custodianship of an old bus depot, just what we were looking for so with the help of a project member who was also involved with the railway we were offered the opportunity to store/restore? trolleybuses there. With great optimism we restarted talks with the Cardiff vehicle owners but without success so it was decided to look at other options which would bring us links with Bradford and a change of name. 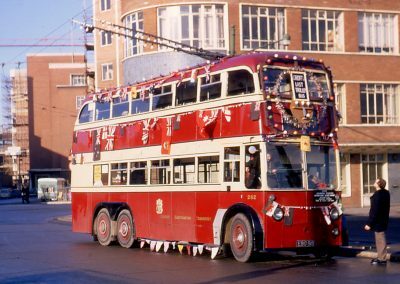 One of our members who lived in the Sandtoft area and worked at the museum owned an ex Bradford trolleybus which was a basic shell which he used as a stores vehicle, but due to a disagreement had to dispose of it. An agreement was reached whereby we purchased it, then followed a weekend visit to prepare it for the journey. Ironically as he was undertaking restoration work on an ad-hoc basis on Cardiff 262 he had saved the BRAINS beer advert from the side of 262 and was using this to keep out the elements on 704 as it was minus amongst other things all its windows. 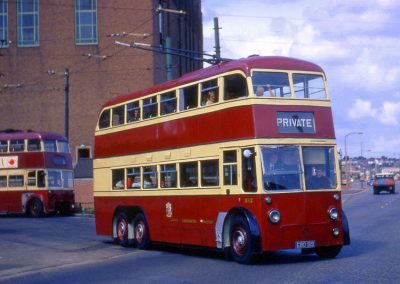 Looking at 704 it is a standard two axle trolleybus dating from 1945 and originally a utility body until modernised by Bradford Corporation in 1959, so on the face of it WHY would it be of interest? 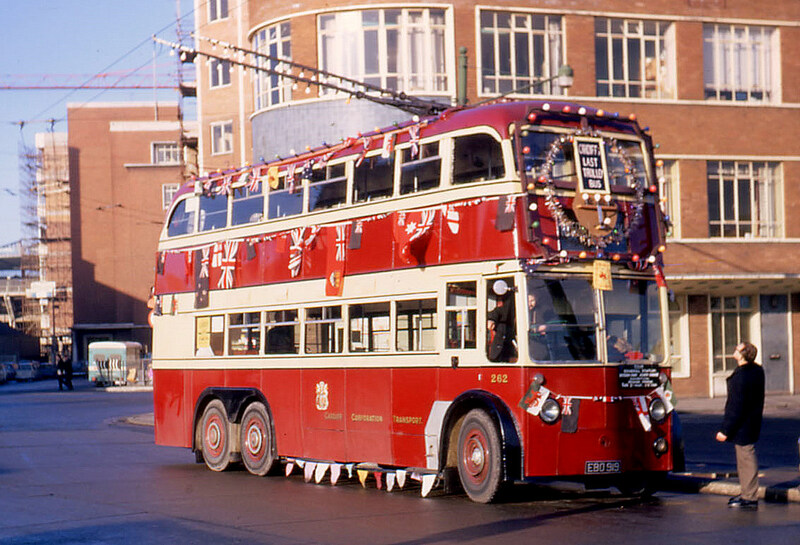 Firstly it was a project that could be achieved, we needed a vehicle but importantly Bradford had a policy of purchasing old trolleybuses as systems closed, then in their extensive workshops converting them for further service. When Llanelli closed a selection of their vehicles were purchased and as 704 had an identical chassis it was a tenuous link and would feature as a vehicle that Llanelli could have had and would be presented in Llanelli colours. With this as the plan the project changed its name from just project to include South Wales. As 704 made it way to Barry the impression we were creating appeared to convince any doubters of our intent and as they say when you want a bus and cannot get one, but then three turn up which is exactly what happened with both 262 and 243 following 704. Part of the attraction of siting ourselves at Barry was the councils bold decision to regenerate the town and part of that plan was the creation of a Transport theme park based on the lines of the ill panned and fated ‘Transperience’ near Bradford. Due to the Industrial and Maritime Museum at Cardiff’s Pier Head succumbing to the developer selling up and moving out, the Vale council were intent on attracting the Museum to the town and including it in the scheme, as well as linking the run down Welsh aircraft museum out at Cardiff Wales airport. The inside of the old bus depot contained a varied cross section of transport items ranging from ten old steam locomotives, old machine tools, a cast iron railway footbridge, railway wagons and two American style passenger carriages used at the turn of the century by Wild Bill Hicocks travelling show, so the three trolleybuses were in good company. These were exciting times indeed as additional vehicle donors took part in the proposals which are too detailed to explain here but we have a copy in our archive and at an estimated cost of £9m worth a browse. After a number of meetings with a working committee in 1997, there were proposals that each participant needed a business plan? and we were encouraged to gain charitable status. The latter suggestion we complied with even travelling over to Taunton to consult with the commissioners, but when we reported to the council we had to be open for a minimum of 104 occasions a year the council failed to agree and thus ended further discussions. Soon there were moves at the depot whereby the ten steam locomotives were being relocated and our trolleybuses had to be moved out and onto the street, eventually agreeing they could be sited on hard standing alongside the depot wall. The project were told that it would take around a week to ten days but being Barry it was decided that a system of security watches by members would have to be introduced, but it is disappointing to report that not more than a handful of volunteers could be found and on the weekend prior to me starting a training course for a new job (having been redundant for three months) at a nearby military base, I spent the Sunday night outside the depot in my car then proceeded to work in the morning. Luckily there was no trouble with the vehicles so a more limited timescale was adopted from around 9p.m. until just after midnight, but instead of the week duration, the incompetence of the contractors we eventually returned inside five weeks later! and so we thought, being over the pit area an opportunity to restart our restoration endeavours. Understandably with no insurance, Health and Safety issues, no water or power access to the building was withdrawn so the project concentrated on maintaining the interest generated and attending shows raising funds whilst the bonus was we were rent free over this period, however the original plans by the council began to founder and soon the government and European grants on which the scheme was based were withdrawn soon followed by the Transport theme park idea. As the new millennium approached we needed to address the situation as to gain credibility the project needed to relocate and commence the long awaited vehicle restoration. Over a number of months Keith pursued a number of options mostly centred on farmland and as the majority of active restorationists were to the East of Cardiff that is where our enquiries centred. We did look to being more central but rent costs and the possibility of vandalism brought us back to the farm idea. Eventually after enquiring at a vehicle scrapyard with an astronomical rent the owner there directed Keith a mile down the road just inside Newport boundary. Here he met up with a sympathetic ear and after brief negotiations and a look around, it looked as if we had found a home but before we could progress there was the matter of a clean up due to Foot and Mouth, but within a few months clearance was given and we could consider the future. With all agreements reached we had organised with Cardiff Bus that they would tow 243 whilst a local small bus operator offered his wrecker whilst we contracted a Cardiff recovery firm to take 262, the cost of which would be £150. Due to a last minute hitch the local operator had to withdraw but it was planned to ask Cardiff Bus for additional help that is until! Cardiff Bus first left the depot with 243 but just four miles away trouble flared as the rear brakes locked on and the driver spent an uncomfortable time in the drizzle dismantling the brake assembly, not what you want to be doing in December so the thought of asking him for more help was out of the question but a hasty call to the commercial operator meant they would return to complete our move. By late afternoon it had been a busy and historical day as 243 had passed through its old stamping ground the Pier Head again only 37years late! and so with the buses in their new home it was onto the next stage, but one item worth recording was that we didn’t have enough money to pay for the extra tow so called in the next day, luckily the owner was out on a call and after a pause he told the receptionist the original fee of £150 which was readily accepted. Since that arrival day there have been major developments, we acquired a 20′ secure shipping container which contains a large selection of power and hand tools, the farmer has attached doors which we extended to reduce natures air conditioning, purchased a scaffolding tower and gradually upgraded the work area which included financing two new ring mains for lighting and power points, donation of a caravan which will soon be adapted as an office and rest room. However recently the group came to the decision that the vehicle that started all this 704 had taken a back seat, and hadn’t received any work (due to lack of number) would best serve the group either moving on to another group or reducing and cashing the scrap in to aid funds and with the space created generate rent from another tenant. Obviously the thought of reducing wasn’t favoured being a trolleybus restoration group, so we were delighted in October this year (2013) to load it up and allow it to go to the East Kent railway at Sheperdswell near Dover who have established their own trolleybus section and now intend to work towards a full restoration to which we wish them well. As to ourselves we will continue with the restoration of the Cardiff examples (which are well advanced), although we are disadvantaged through location we’d like to encourage and attract new and younger members to the “only trolleybus restoration group in the Principality” with two very unique vehicles, whilst continuing to develop the workshop to achieve our aims, why not come and have a look and maybe join, there are lots of things to do in a variety of tasks, something for everyone. A few random photos of the trolleybuses in service, so you can see how they looked in their prime. 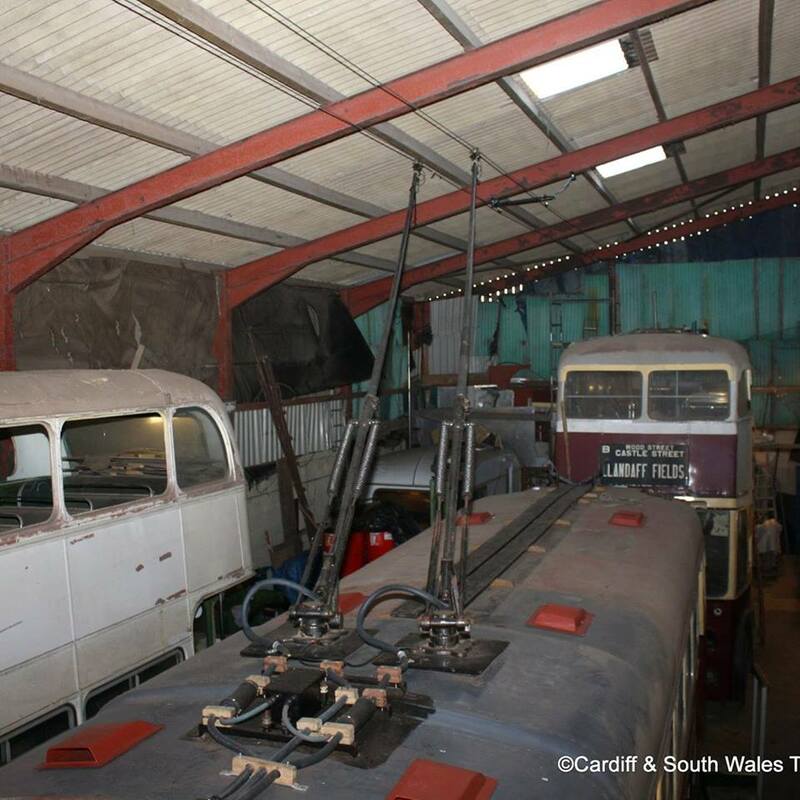 Since we have been at the barn, we have been making great advances in the restoration of the 2 trolleybuses we have. Please have a look around the rest of the site, and if you like what you see then please click on the membership button the home page and help us to keep going, by becoming a member. Thank you for looking at our site! Please help the project by donating anything you can, its very much appreciated! We aren't given any grants or support by the government so we rely on donations and fundraising to survive. Please click onthe link below.